It may not be getting any cooler in most places, but the days are getting shorter and the nights are getting longer, and fall is surely on the way. I know a lot of crafters who basically take the summer off. Some people's craft rooms don't have air conditioning, others just don't watch television (which is their crafting time) during the summer. Others simply can't bear the thought of touching wool when it's that hot outside. Still others have their hands busy with the kids during summer break, and look forward to resuming their crafting once the kids go back to school. Now is a great time to sort through your crafting supplies. They have had a few months to “cool” in your emotions, which makes it easier for you to assess them with a sober eye. And now is the time to start laying the ground work for the big ramp-up to fall crafting. This is also a good time to find sales on crafting materials. 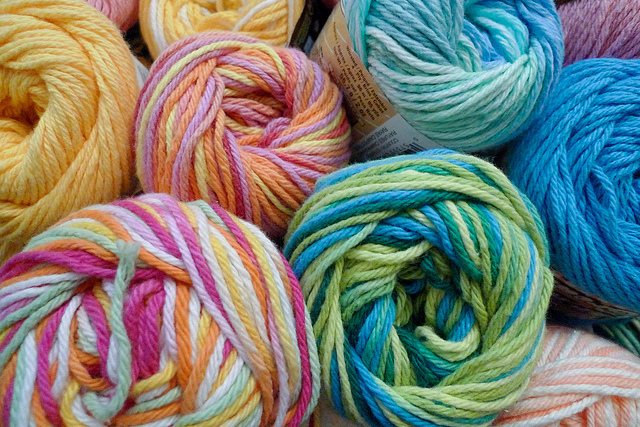 I have noticed that many yarn stores and craft stores have big sales in summer, partly to make room for fall inventory, and partly to draw in customers who have drifted away over the summer. Are you excited for fall? I can't wait, personally!